Manchester United remain on top form at the moment. They have two straight wins in the UEFA Champions League against FC Basel and CSKA Moscow. They also sit at the top of the Premier League standings alongside Manchester City. And as if that was not enough, thy already are in the fourth round of the Carabao Cup. It’s hard not to call the early portion of the season a success for The Red Devils. But if United have been so good it’s not just because players like David De Gea, Henrikh Mkhitaryan or Romelu Lukaku have been on top form. The success has come from the team’s depth. Despite making changes almost in every single game, the team continues to perform. And that depth will once again be tested this Saturday in the Premier League match against Crystal Palace at home. United are slowly beginning to look like a depleted team due to injuries. And Saturday won’t be any different. Michael Carrick missed the clash against CSKA Moscow, and has already been ruled out of Saturday’s match. Phil Jones and Marouane Fellaini also missed the trip to Russia after picking up injuries in the 1-0 victory over Southampton last weekend. Mourinho was not too optimistic with the trio’s form after United’s convincing 4-1 win on Russian soil. “I think Carrick has no chance. I think Jones, I have many doubts, and Fellaini, I have a hope but just a hope,” he said. So it sounds as if Jones might start, but Carrick and Fellaini won’t. No updates have been given on Antonio Valencia or Paul Pogba, however. The Ecuador international did not travel with the rest of the team to Moscow, and his status for the showdown against Palace is uncertain at the moment. And Pogba continues to recover from a hamstring injury suffered a few weeks ago. Last but not least, Anthony Martial left the game against CSKA in the second half as a precautionary move, but he should not have problems to feature this Saturday. Which Players Appear As Potential Replacements? All things considered, Manchester United might be quite depleted on the defensive zone. The potential absence of Valencia could open the door for Matteo Darmian to start on his natural right-back role. And while the Italian has mostly played as a left-back since joining the club, there is no question he fits better on the opposite flank. Jones might be fit, but he will likely be a game-time decision. Victor Lindelöf could start instead, as the Swede is coming off a strong performance against CSKA. Repeating that performance at the Premier League could do wonders for his confidence going forward. The midfield area is where things are most complicated. 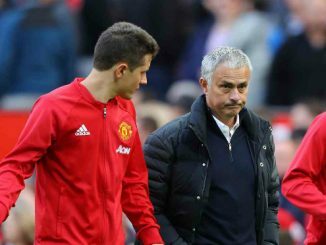 If Pogba, Fellaini and Carrick are all out, then Mourinho would be obliged to start Ander Herrera and Nemanja Matic as the CM duo. That is not a bad pairing by any means. And in fact, having a player such as Herrera on the bench speaks volumes of the team’s depth on that area of the pitch. There is also the chance of Martial not playing, as Mourinho could give him some rest so he can heal properly. It’s a long season, and it’s not Mourinho’s style to risk players if there are other options available. Marcus Rashford, Jesse Lingard and Juan Mata could all feature on the wings if needed. There is a chance we can see changes once again on United’s lineup for Saturday’s game against Crystal Palace. But the team has been here before this season. And the subs have – at times – performed even better than the starters. So fans shouldn’t worry about a few players being absent. The team is deep enough to mask several absentees all at once.